You decided to take on a remodel project yourself. Everything is going great and you’re just about finished. You’ve got your drywall finished and primed, your flooring installed and it’s time for trim. So you break out your hammer and finish nails and start nailing down the first board. Your first drive of the hammer feels great, this is going to be a breeze! Your second drive bends the nail a little bit. No problem, “I can correct this with a gentler strike at a different angle.” The finish nail now is now completely bent out of shape. You grab the claw of your hammer and yank the nail out. If you’ve already price shopped a little bit, you’ve come to find out that angled finish nailers are a bit more expensive. Don’t let that fact fool you into thinking that they’re the superior choice for every job. If you need to install 5 pieces of trim in your living room – save your money and purchase a low-cost straight nailer. The nails for straight nail guns are typically less expensive than their angled counterpart. The lower price comes at a cost. That cost is flexibility. The straight magazine tends to get in the way if you’re trying to drive a nail into a tight spot. The higher gauge nails (thinner) that typically go along with straight nailers are ideal for trim and other detail work that require not only that the nail head to be hidden (smaller nail head), but also a reduce chance of splitting the wood with a larger nail. When we talk about brads, we’re referring to very thin nails (18-gauge or thinner) with very small heads. Brads are ideal for very light trim work, like shoe molding, where splitting can easily occur. Brad nailers are very cost-effective, getting down to $20 for a low-end product. Finish nails are larger (16-gauge or larger) and fasten better than brads, but they require you to fill the nail hole, if it’s visible. Whereas brads often don’t require any filling. Let’s talk about the two different ways nail guns are powered. The first, and less common, is the electric nailer. Electric nailers are the clear choice for convenience. They don’t require another tool to power them (air compressor) and you aren’t restricted by the length of an air hose. You also won’t be slowed down waiting for an air compressor to refill. 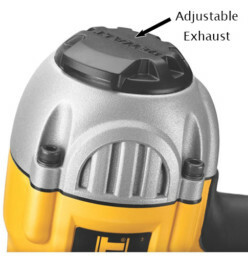 Since air tools are powered by a compressor, much of the complexity within the tool is removed. If you already own an air compressor or plan on purchasing more than one nailer, the pneumatic option is likely the best choice for you. The direction of the exhaust is a seldom thought about feature when it comes to the purchasing decision process. Exhaust refers to the air that is expelled from the gun when firing a nail. A poorly located exhaust could lead to dust being constantly blown in your face! It seems that most nail guns have forced the air exhaust out through the back, which is great, though not perfect. A nice feature of some nail guns is the ability to adjust the direction of the exhaust away from you or your work piece. I’ve been using the DeWalt 51257 (pictured at the top of this post) for almost 8 years now. I’ve gone through thousands of nails, using it to build cabinets, install exterior and interior trim and many other projects. The gun will accept a 16-gauge nail between 1″ and 2 1/2″ in length. It almost never jams and has an adjustable rear exhaust. It’s absolutely one of my top 5 favorite tools. I bought it at home depot 8 years ago for over $200, but it looks like Amazon now has it in the $150 range. This entry was posted in Workshop / Tools and tagged finish nailer, tool reviews on June 6, 2018 by diy. If you’d feel most comfortable having a professional take care of this process start to finish, hiring a Certified Radon Tester is the way to go. You can find a Certified Radon Professional by starting at the EPA’s Radon website, choosing your state, then following the links from there. Expect to pay around $150 for a Certified Radon Pro to come to your home, perform the test and provide results. You can save a few bucks by ordering a Radon Gas Test Kit for around $15. It typically takes two to four days for the test to complete. Once the test is complete, you’ll mail in the kit and can expect results to be emailed to you within two or three days. Keep in mind that with both methods above, a 3rd party now has additional “data” related to your home. This may bother you, it may not. But it’s worth noting. My personal reason was that I decided to build my own radon mitigation system and I wanted to be able to test multiple areas of my home, before and after the install. Whatever the reason, I think you’ll find the cost isn’t that prohibitive. 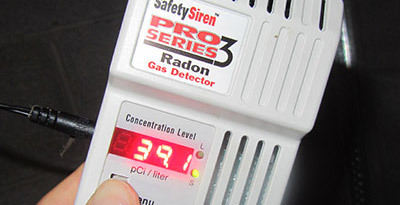 I purchased the Safety Siren Pro Series 3 Radon Detector on Amazon for about $130. There are a couple different products out there, but this one was the lowest price I could find and it returns a reading in 48 hours. It will also continually monitor your short- and long-term radon levels for you. My radon reading: pCi/L. Yikes! Setting it up was extremely easy. They recommend placing the detector at least a foot away from any walls, in a spot that doesn’t have any air flow. I personally hung the detector from the ceiling, by its power cord. Whether you’re considering Radon mitigation or not, it’s still a good idea to at least have the facts about your home’s radon levels, especially if you’re in a high-radon area. This entry was posted in Quick Tips and tagged radon on May 22, 2018 by diy. I say five minutes because the actual prep time really is only about five minutes. Of course, the time that the sap takes to drain out of the tree, as well as the time to boil the sap it is quite a bit longer. But this really does work, and it’s really really easy! I had no trouble making delicious syrup on my very first day tapping a tree. The trick is to wait for the right time of year. In the Northeast, that time is late March / early April. Grab any kind of bucket or container and set it under the tree. Find a spot on the tree about 4 feet high and drill into it at an upward 45° angle, about 2 inches into the tree. Then, stick your tube firmly into the hole you just drilled and point it so it drips into the bucket below the tree. 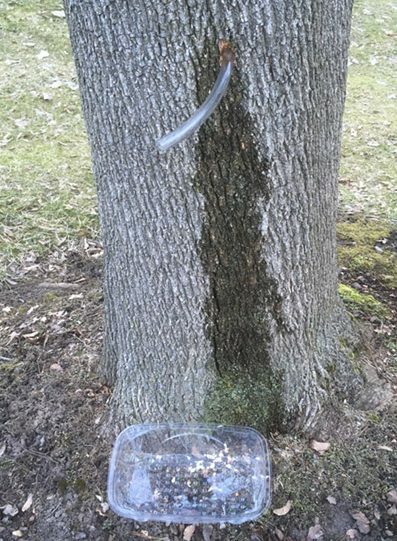 You’d be surprised to find out that it only takes less than a day for a gallon of sap to drip out of the tree, depending on tree type, season, etc. At first you might think, “what is all this water doing in my bucket?“ Rest assured that this is tree sap, it is supposed to look similar to water. This next step is even easier than the last one! 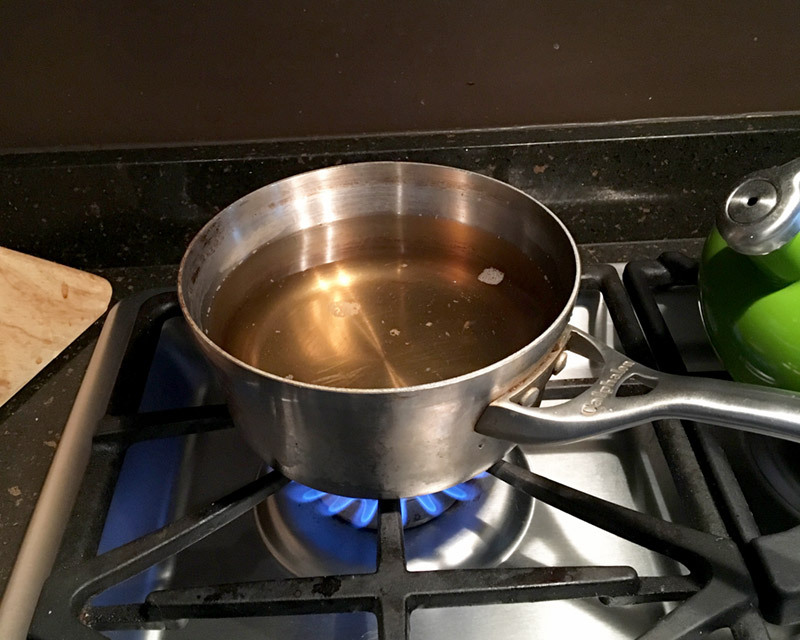 Just grab the largest pot you have, dump your sap in it and get it to a boil under high heat. 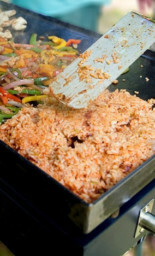 Once a good amount of the water has evaporated, go ahead and transfer it to a smaller pan and continue boiling. Stop boiling whenever you are happy with the taste. For me, it was somewhere around an hour per gallon. As far as cleaning the pot afterwards…I found that maple syrup cleans up very easily. Walnut sap took a little bit more effort, for some reason. Transfer the syrup to a container and pop it in the fridge. They say it should be good for about two months. Before you get overly excited, you should know that the amount of syrup you get is a lot smaller than you’d expect. The pros say that you’ll need 40 gallons of sap to make 1 gallon of syrup! I actually found my syrup to have a good consistency and taste when boiling a gallon down to about a cup (8 ounces). It’s a little on the thin side, but the taste is definitely there! If you do want to tap your trees on a regular basis, you might consider a tapping kit. Amazon sells a few maple tapping kits. I have not tried or tested any commercial tapping products, so you’re on your own there! This entry was posted in Exterior & Landscape on March 26, 2018 by diy. This post is a little off-beat. When we think of DIY projects, cats in litter boxes typically don’t come to mind. But being a successful DIYer starts with a good night’s sleep! And that can’t happen if the sound of your cat scratching against the sides of the litter box wakes you up at night. You would think a solution would exist for this. I looked all over the place for litter boxes that were made of a material other than plastic. The closest solution is the “enclosed” litter box that is really designed to be more decorative than soundproof. The Flex Seal commercials are almost humorous. There’s no way I’m riding in any boat that has a giant hole in it, only to be repaired by Flex Seal! In my case though, Flex Seal was the first product that came to mind when I wanted to “rubberized” our cat litter box. Run a cat’s claw against plastic and it’s almost an ear piercing sound. A cat’s claw against a rubber surface, however, is practically unnoticeable. A general rule of thumb is that products will stick better to a surface that is scuffed and dull than bright and shiny. So grab an old or leftover piece of sandpaper and scuff up all areas of the inside of the litter box. Having never used Flex Seal before, I thought I could just dump it in the litter box and kind a swish it around to cover the bottom. You want to have an old paint brush or some kind of spreader to move the Flex Seal around after you pour it out. Make sure to coat the walls of the litter box as high as possible. Suffer for One More Night! Unfortunately, Flex Seal takes a while to dry. Especially if you laid it on there pretty thick. Give it a full 24 hours before dumping any litter onto it. It’ll all be worth it when you get that beautifully sound sleep the following night! This entry was posted in Quick Tips and tagged cat scratching litter box, no sound litter box, noisy litter box, quiet cat litter box, soundproof litter box on December 17, 2017 by diy. A couple years back, we posted an easy way to remove shrubs or bushes using your vehicle. While we still stand behind that method, it may not always be feasible or would require too much work to clean up ruts in the grass that the vehicle made. Beyond that, not everybody has a vehicle capable of pulling a stump. Another option to consider is to use a winch to pull your bush, shrub or small stump. I got a 4-8,000 pound manual winch on Amazon for under $50 and a couple of tow straps as well. As you can see in the video below, I wrapped one end of the tow strap around an existing stump that I had. I then wrapped the other strap around the shrub stomp I was trying to remove. Then, joined the two straps together with my winch in the middle. It didn’t take too much effort to start cranking the winch and hear movement in the shrub roots. After about a dozen cranks on the winch, I was able to easily remove the shrub stump by hand. This entry was posted in Exterior & Landscape and tagged shrub removal, stump removal on December 6, 2017 by diy. When you think about it, we’ve all wasted a lot of bread in our time! If you go through a loaf of bread per week, that’s 2 end pieces wasted every 7 days. That’s over 100 pieces per year (enough to make up a few loaves of bread). Not to mention the extra space used up in your trash bag! So how do you reclaim that end piece that nobody wants? Take 20 seconds to watch the video below. This entry was posted in Quick Tips on November 27, 2017 by diy. I’ve been on the jerky kick lately and it has not been good for our finances! That is, until an acquaintance of mine offered me some venison jerky and I asked him how he made it. It turns out that there are tricks to the way you slice the meat, marinate it, pre-cook it and dry it. This entry was posted in Food / Cooking on November 15, 2017 by diy. “Didn’t I just fill the gas tank?”, I would ask myself week after week after cutting the lawn. That is, until I finally realized that there’s a gas leak somewhere! The reason it took so long to discover the issue is that the gas was leaking so slowly that it was actually evaporating and not leaving any trace. Yes, gas evaporation is a thing! There have been studies on it. When trying to find the source of the leak, I started at the gas tank. Then I worked my way down through the fuel line, past the fuel filter and then right behind the air filter box where the carburetor sits. Bingo! When I reached my hand behind the air filter box, I could feel that the carburetor was damp with gas. My first thought was, “Dang! I’m gonna have to replace the carburetor.” But carburetors are over $100, plus whatever time it takes to figure out how to swap it out. Next thought, rebuilding the carburetor. I’m sure the kits are inexpensive. But it still involves removing the carb, figuring out how to rebuild it, then replacing it. Then, the most obvious choice hit me while I was sitting there staring at fuel line. An inline shut-off valve! Not only are shut-off valves inexpensive (about $9 for 5 of them! ), but they’re extremely easy to install. All you have to do is cut out a segment of your existing fuel line (it’s easiest to do this when your gas tank is empty) and replace it with the inline shut-off valve. That’s it! You now just have to get in the habit of shutting off your gas line after each use. As a bonus, this will not only conserve your fuel, but will make winterization one step easier (as you now have a gas shut off valve). Just before your last use of the season, turn off the gas line while your engine is running and let it starve itself out of gas. This will prevent any residual gas from gumming up your components, especially your carburetor. 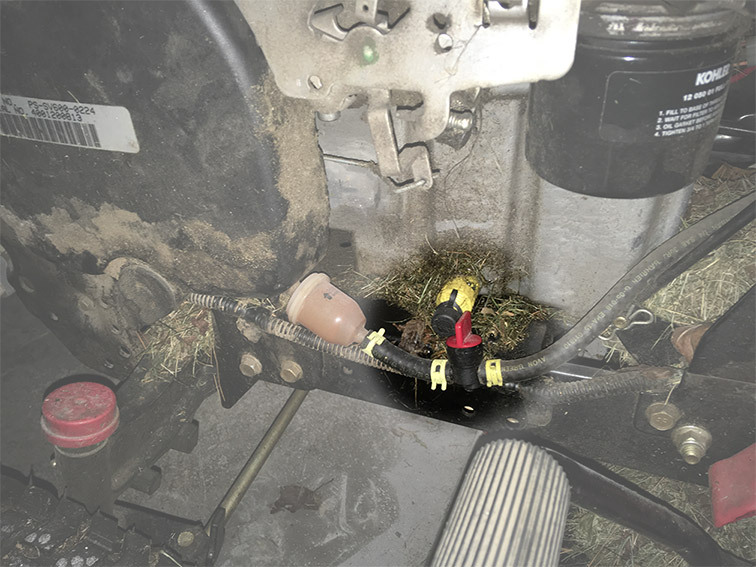 This entry was posted in Quick Tips and tagged lawnmower, lawnmower leaking gas on October 11, 2017 by diy.